These days we're not short of films focused on the state of the planet's environment. Movies like The Day After Tomorrow, An Inconvenient Truth, 11th Hour and the latest The Age of Stupid are indications that the film industry is hot to trot in terms of feeding people what they are most keen to digest at the moment. Green knowledge is good for us, if we want to survive the next century that is, and we're craving it like never before. 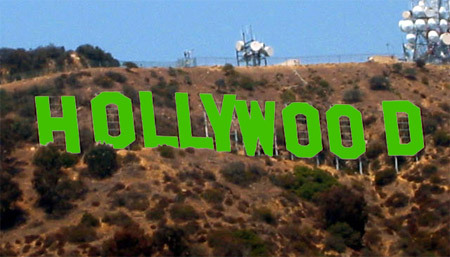 The glamorous albeit money making machine that is Hollywood, is doing its best to get it to us - but at what cost? A UCLA study in 2006 called Sustainability in the Motion Picture Industry found that the ecological impact of the Californian film and TV industry lay only behind the petroleum and aviation industries. The Age of Stupid confessed it's total carbon footprint in its closing credits at 94,270kg of CO2 which is about the amount created by eight Brits per year. Huge lighting rigs, massive energy consumption from generators required on location, heavy diesel-guzzling trucks for transport and all the excesses that surround the charm of the industry; Hollywood doesn't tread lightly. What are they doing about it? Warner Bros and 20th Century Fox are apparently on it. Green Power generators that run on ultra-low sulphur diesel and sustainably sourced soya bean; the world's first high powered low energy LED lighting system; and an eco digital cine camera that is film and tape free are just some of the ways Hollywood are hoping to green up. The Best Practices Guide for Green Production created by the Motion Picture Association of America is another initiative that sees the film industry greening up. A new code for the UK film industry, Green Screen, is also aiming to reduce London's movie footprint by 60%. And it seems it's been working with Evan Almighty being the first carbon zero comedy. Film is the perfect vehicle to get the eco message to a wide audience. The higher the standard of quality of production and the more poignant and captivating the script the more likely people will take notice... particularly if its own green credentials are modelling that message. The more movies that get people to care to the point of acting upon their sensibilities, the healthier our planet will be.